The wildfire that swept through Santa Barbara County, California, last week forced over 95,000 residents to flee their homes and destroyed 269,000 acres of land – an area bigger than the size of New York and Boston combined. But fires haven’t always been so destructive, and North Americans haven’t always feared them. It’s well known that the first mainland residents of North American used fire as a land management tool in fairly typical climatic environments, like grasslands in Oregon, temperate forests in Virginia, and drier regions of the Sierra Nevada. Now, a new study reveals that the ancestors of First Nations in the incredibly rainy and wet region of coastal British Columbia may have also started forest fires intentionally. 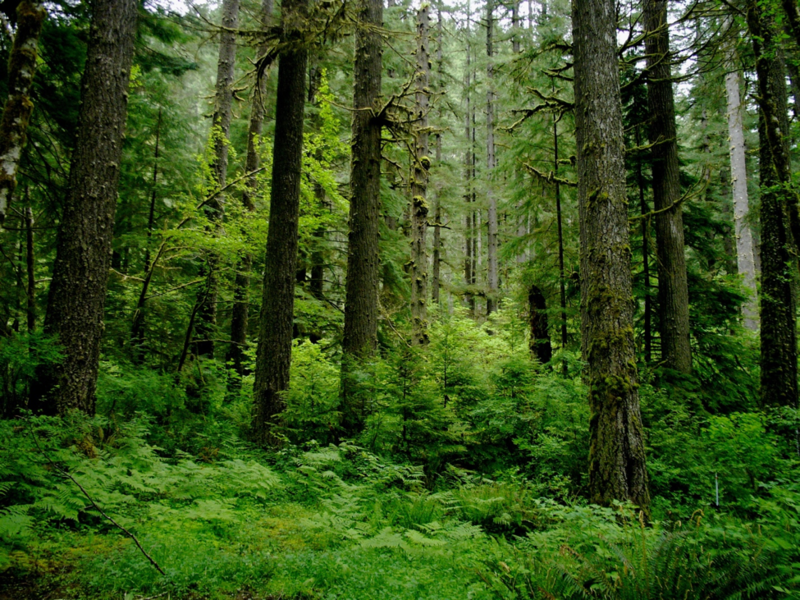 On Hecate Island, which lies just off the coast of British Columbia, moisture permeates nearly every inch of the forest; more than 4,000 mm of rain falls on average per year, according to the Ministry of Forests Research Branch, which is more than even the most drizzly highlands of Scotland. Despite the fog and rain, the recent research suggests that First Nations may have relied on fire as a tool nonetheless, burning sections of land near settlements to create open spaces and promote the growth of desirable plants. Spots that burned frequently likely yielded a higher diversity of plants as the ecosystem recovered, as well as a higher density of plants that might be useful to First Nations as either food or medicine, according to the study. For instance, elders in nearby communities recount using fires to help regenerate blueberry bushes, the study authors write. The high fire frequency is not necessarily natural for these coastal rainforests, but the fires seemed to be beneficial. Considering that fires now burn less frequently and more destructively, perhaps there is something to learn from historical burning techniques, even in some of the wettest landscapes. In the bog-like forests of coastal British Columbia, trees can live for thousands of years. Some grow to be huge, with stems thicker than a human arm span. Others, in the wettest spots, grow only about five feet high, gnarled by 1200 years of storms. They grow slowly and steadily. The wood holds onto memories of the past like an almanac. Every year is documented as a ring in the wood, and every fire leaves a noticeable scar. The researchers collected wood cores and wedges from 100 trees in 50 different locations on or near Hecate Island to reconstruct a history of the fires in the area dating back to 1330. Where the tree was burned, the fire left a slightly darker mark or a lobe in the wooden ring pattern. These marks bore evidence of 16 fires, the first of which occurred in 1376. The signs of fire ended abruptly in 1893, approximately the same time First Nations were pushed out of the area. So from 1330 to 1893, there were fires approximately every 39 years, the study authors wrote. Although they can never be entirely sure, the researchers used multiple lines of evidence, like weather and spatial patterns, to deduce that the fires were most likely human-caused. “I can’t imagine how difficult it would have been to start those fires,” says Kira Hoffman, lead author of the study which was published in the Journal of Biogeography on Sept. 20, 2017. The forest is nearly always wet and damp, and First Nations didn’t have anything like matches. Hoffman speculates that they managed to use traditional fire-making methods during times of relative drought. They likely started fires near shorelines and timed them with onshore or seasonal winds to help control the fire and protect settlements from burning. “I think that the members of the First Nations’ communities who were burning would have been very well-trained and known a lot about fire behavior,” Hoffman says. Fire was carefully managed in coastal First Nations communities, Hoffman’s research suggests. Nonetheless, the frequency of the use of fire reported in her new research is surprising, says Helen Poulos, plant ecologist at Wesleyan University who was not involved in the study. Coastal rainforests are typically characterized by intense, but rare fires. In fact, they normally only burn every 240 years, according to a study on coastal rainforests in Oregon. And when a fire burns, it tends to kill most of the trees. But the fires that First Nations started seemed to be smaller and less intense, according to the study, likely because they burnt more often. Usually, when forest fires burn more regularly, there is less vegetation to burn the next time around, so the fires stay smaller, and don’t get as hot. They also tend to be less destructive. The smaller, more frequent fires that coastal First Nations started created “a mosaic of vegetation,” says Poulos, leaving some patches of trees standing and clearing other spaces for new growth. Unlike most of the fires today in North America, they were more beneficial to communities. Low-severity ground fires were part of healthy forests, says Hoffman. “Our only experiences with fire right now are these large uncontrollable wildfires and people really fear them,” she says. Contemporary fires burn differently than those in the past because burning practices and fire management shifted dramatically with the arrival of colonists, Poulos says. Europeans reduced the spread of fires (both natural and human-caused) as they came to dominate the West. But the forest didn’t stop growing, adding more wood to a building pile. “We’ve had over a hundred years of mounting fuel loads,” says Poulos. And it seems we are paying the price. “Now when fires burn, they burn really hot,” she says. A number of severe fires have ravaged the rainforests of the Pacific Northwest in recent years, says Jessica Halofsky, fire researcher for the U.S. Forest Service and the University of Washington. Although she recognizes that fire is normal, in many cases, it’s unsafe today because there is a lot of vegetation in the forest to burn and often, fires are too close to communities. The U.S. Forest Service is mostly “still in a suppress-all-fires mode,” she says. And prescribed burns in rainforests likely won’t happen anytime soon. Once a fire gets going, she says, it’s hard to control. Uncontrollable wildfires are a problem that isn’t limited to coastal rainforests, though. In drier regions that are more fire-prone, like California, disastrous forest fires are becoming increasingly common. A lack of proper forest management is partly to blame. Even though Cal Fire, the state’s wildland fire-fighting division, uses practices like vegetation thinning and prescribed burning to reduce fuel loads, current management practices and the way they’re applied are not proving to be enough, according to an article in the L.A. Times. This past year, Californians have seen some of their worst fires in history. And increasingly, the state has to spend more time and money putting out fires than preventing future ones.